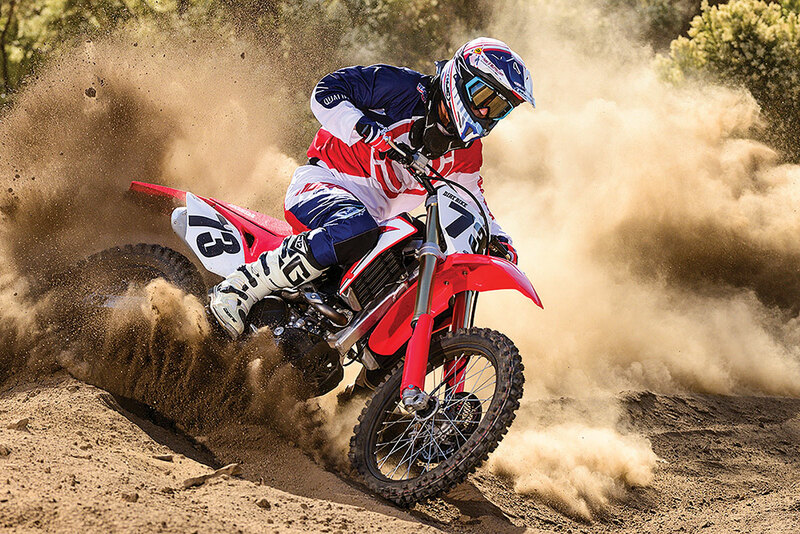 The 2019 Honda CRF450RX is a hybrid in the motorcycle world; the motocross/off-road mix. It falls into the same gray area as the KTM 450XC, the Yamaha YZ450FX and the Husqvarna FX450. This Honda isn’t a product of re-engineering as much as a mixing of part numbers. 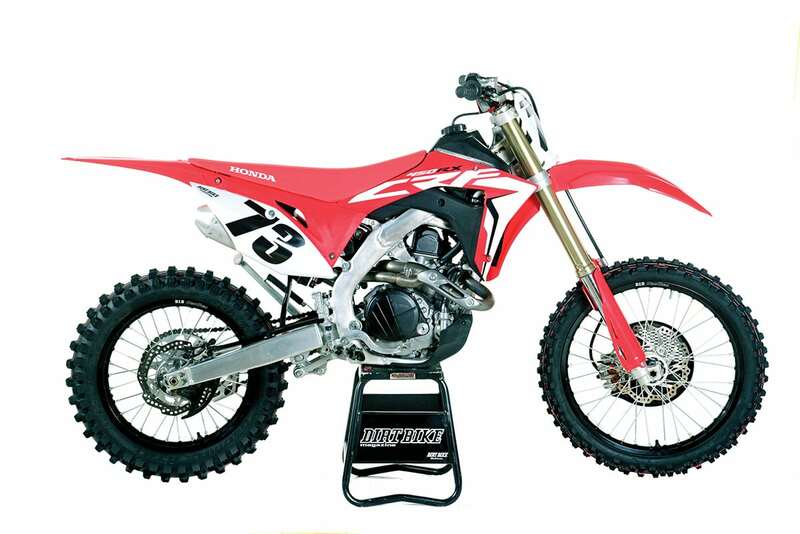 The RX is about 90 percent CRF450R motocross bike. The rest is a sprinkling of off-road parts and features. The result is somewhat ambiguous. The RX isn’t really an off-road bike in the traditional sense, but it’s certainly not aimed at the motocross purist. Maybe its lack of clear definition is its greatest strength. 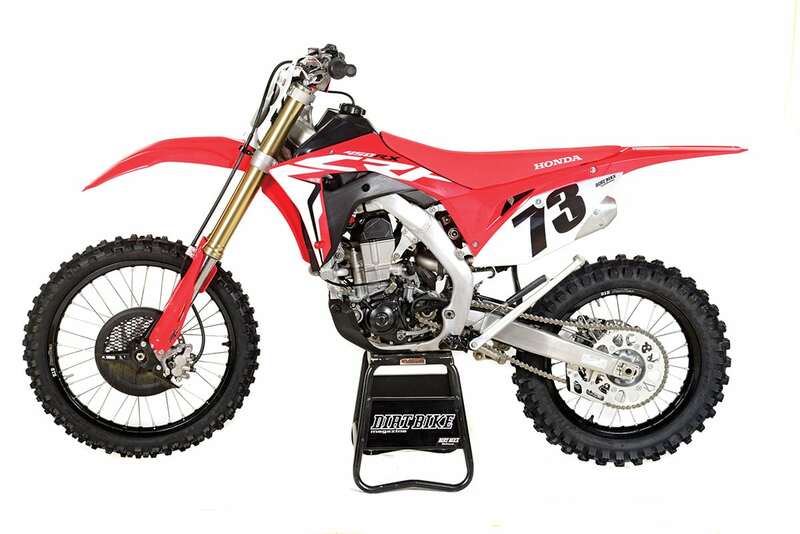 The Honda CRF450RX is a motocross/off-road hybrid that leans heavily towards MX. Honda isn’t alone in the class-straddling business. KTM, Husqvarna and Yamaha also offer what they call “closed-course, competition off-road bikes.” Honda doesn’t submit the bike for EPA emission or noise testing, which is required by the federal government if a bike is to be ridden on federal or state land. 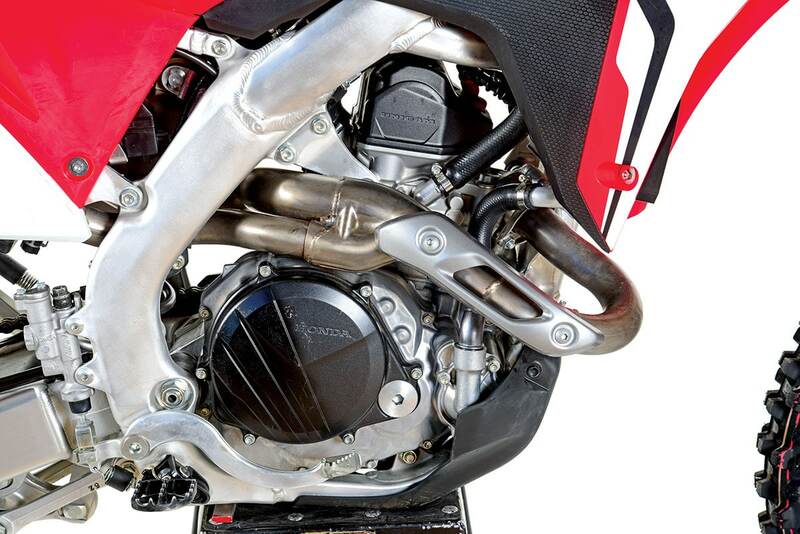 Honda has another model—the CRF450X—to fill that slot. In practice, the EPA certification goes unenforced in most states, although the Forest Service does insist on spark arrestors. On the RX, Honda leaves that job for the aftermarket. The main features that separate the RX from a pure MX bike are the 2.2-gallon fuel tank (up more than a 1/2 gallon), an 18-inch rear wheel, a kickstand, suspension settings and power delivery. Otherwise, the bike is just like the motocross version and gets all the same changes it did for 2019. The list is actually very long. It starts with a new frame that has a little more flex built in than the previous one. Same goes for the swingarm, which has narrower arms. The shock linkage is different, and Honda focused a great deal of attention on the front brake, which has larger pistons and a more rigid hose. Within the motor, Honda continues to call the valve train a “Unicam” design, although the distinction between that and other SOHC motors has become vague. After the 2016 redesign, the motor no longer positions the cam directly over the intake valves. Now, it’s slightly offset to allow the use of finger-followers, which provide more lift without the use of oversized intake cam lobes. If you’re a gear-head, you probably have noticed this as a more commonly used feature in smaller DOHC motors. On the exhaust side, the Honda engine uses full-size rocker arms. Last year the motor lost its kickstarter, as Honda warmed up to the fact that people finally trust the button. Now, even the provision for the kickstarter is gone. That freed up some space for a larger exhaust mid-pipe and even resulted in a slight increase in engine-oil capacity. Honda also gave the engine a new oil scavenge pump. With the previous model, riders quickly learned that they had to overfill the motor slightly to get full clutch life. That shouldn’t be necessary anymore. While they were at it, Honda engineers redesigned the clutch lifter and pressure plate to allow better lubrication. Even the piston should have better lube with a new five-nozzle oil jet. 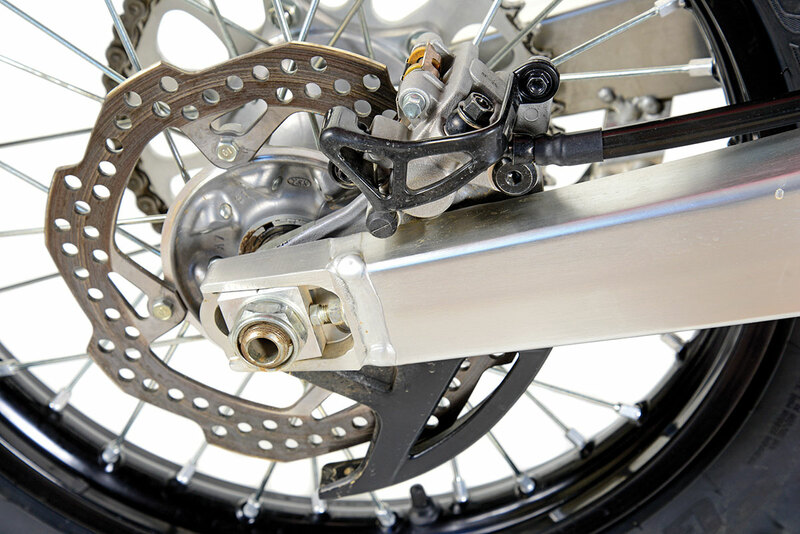 The brakes are among the many components that are identical to the ones on the motocross bike. In keeping with the trend of concentrating just as much on the electronic front as on mechanical updates, the 450 engine now has a gear sensor that allows the engine’s central processing unit to provide a different map for each gear. For the RX, those maps are different from those of the R motocross bike, and there are three different variations that the rider can choose via a handlebar switch. Honda also gave the bike a launch mode to tailor the power delivery specifically for better traction off the start. 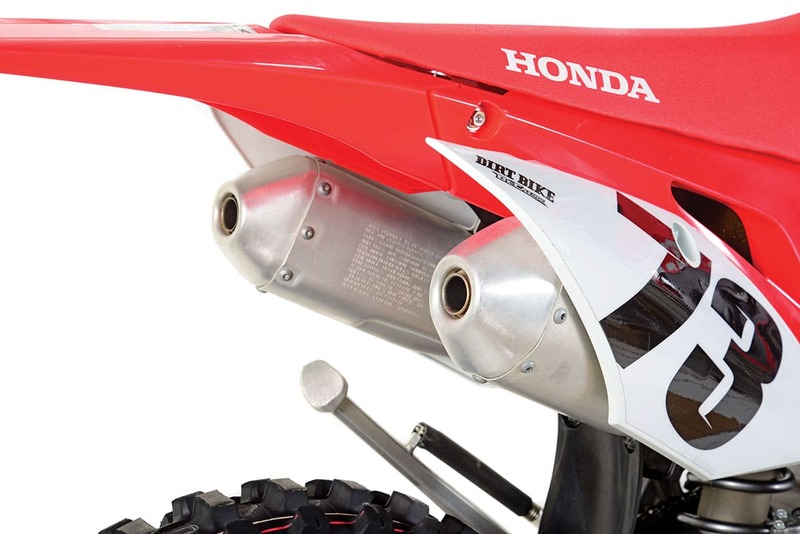 Someone at Honda likes the idea of twin pipes, but it makes little sense on off-road bikes. It will cost twice as much to add a spark arrestor. On top of all that, Honda gave the bike a number of detail changes. The handlebar is finally an oversized Renthal Fatbar, and it has four possible locations. The rims are black, and they wear Dunlop AT81 tires, which should have a longer lifespan than the MX3s that come on the motocross version. The fork guards are full wraparounds now, and the RT gets a sealed O-ring chain. HOW MOTO DO YOU WANT TO BE? There are a number of MX riders who believe the RX is better on the track than the pure motocross model. That’s because the R is such a rocket. In Dirt Bike’s 2019 450 motocross shootout, the Honda was the king of the dyno. It wasn’t one of those things where the power was deceptive, either. From the first twist, you knew that you better hold on tight. The RX is still a rocket, and it’s still faster than most of the 450 motocross bikes on the market, but the effort that Honda put into making the power more manageable for the off-road guys also makes it more manageable on the track. It’s a little softer down low, and there seems to be less engine braking when you chop the throttle at speed. Off-road equipment includes a 2.2-gallon tank, an 18-inch rear wheel, a skid plate, a kickstand and an O-ring chain. The power delivery and suspension have also been tuned for fast off-road riding. On western-style GP tracks, the power is perfect. These courses tend to be hybrids themselves, with a high percentage of MX mixed in with some two-track and very little singletrack. As you move through the spectrum of off-road venues, the next stop on the way is probably a sprint enduro, with more off-road sections and less MX. The Honda is still fairly well-suited for that, although weather tends to be more of a factor as you move across the country to where these are held. If it’s muddy, the Honda’s milder map (number two) smooths out the power delivery even more. If you’re looking for a real trail bike, the RX might be a little too much. Honda has the 450X for that market. On slower, more technical courses such as GNCCs and national enduros, the Honda is a beast on any map. Young, strong riders like Trevor Bollinger can use all the power they can get, but most riders aren’t him. The Honda can be exhausting. Its weight is a secondary issue here. It’s 243 pounds, which, combined with the power and the fact that the Honda is a physically big motorcycle, makes the whole package more and more difficult in slow, technical terrain. By the time you get to the far end of the off-road spectrum to hard-core, old-school tight trails, the Honda is far out of its element. It stalls easily, overheats quickly and is generally unhappy. Honda knows this, and that’s why the CRF450X exists. That’s the one with the softer power delivery, the wide-ratio six-speed and polite trail manners. Having it in the lineup gives the RX license to be a purebred. 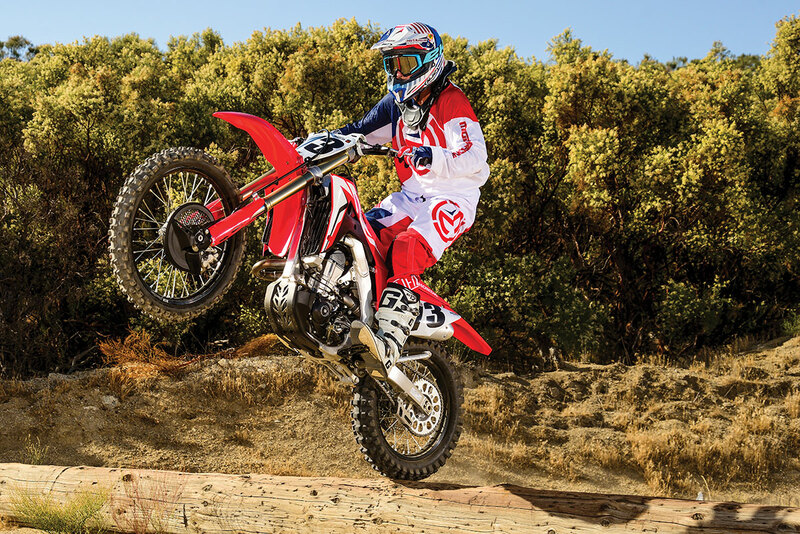 Honda set up the CRF450RX’s suspension to be just a little more cushy than that of the motocross bike. The shock spring is 52 N/m, which is one step softer than the MX bike’s. There are valving changes at both ends that result in a noticeably cushier ride, but not so much that it’s mushy. 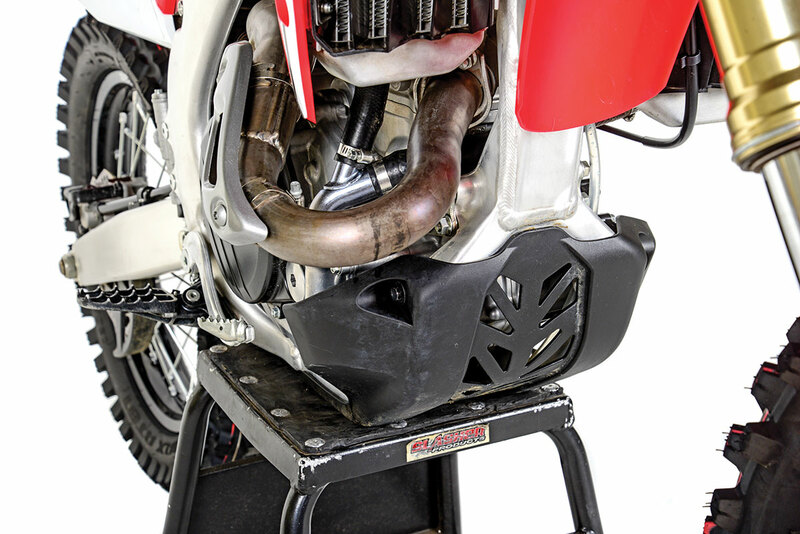 You can take the RX on a motocross track without suffering too much dive or hard bottoming. It’s a very well-balanced setup that serves the bike’s intended use as well as possible, considering that its intended use is so hard to define. Between the softer suspension and the softer power delivery, the RX is also a particularly good play-racer. It’s no secret that most motocross bikes never go racing. They end up in the hills and playpens that aren’t necessarily recognized on OHV maps. It’s a good bet that most off-road miles aren’t logged on established trails but rather on private land or places just out of view. The RX has the power to climb any hill that’s climbable and gives play riders a buzz. It’s all about fun, and we’re the first to admit that power is certainly fun. The extra fuel capacity is about right too. The RX can go full blast for an hour. If you really want more range than that, there’s an aftermarket tank from IMS that holds 3 gallons. Understanding what the RX does and who it’s for is most of the battle. Luckily, most riders are getting used to the idea of an off-road bike that was designed for the track. KTM XC models usually outsell the motocross bikes. How does the Honda stack up against others with the same job description? It’s in the hunt. They have similar shortcomings on the trail and are very competition-oriented. The formula varies slightly between the XC line, the Yamaha FX line and so forth, but it’s a legitimate class of motorcycle now, and it will be good fodder for a full shootout later in the year. It’s no longer an issue for a trail rider to walk into a dealership and walk out with the wrong bike. 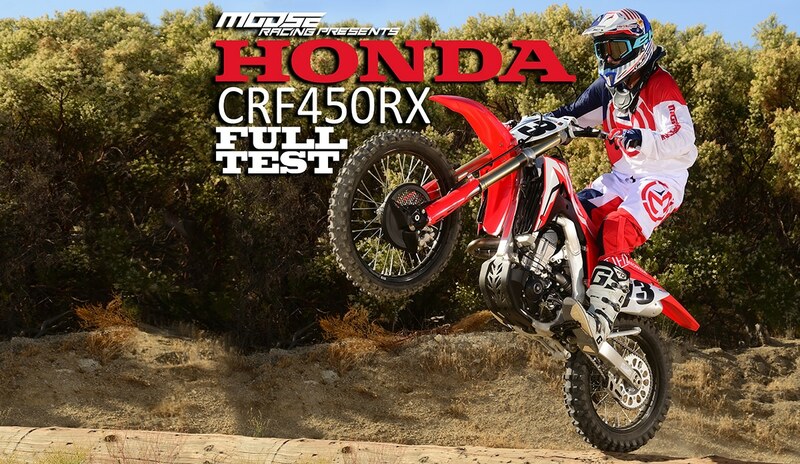 The Honda CRFR450RX is a lot of motorcycle. If you understand that going in, you’ll be happy. Fuel tank capacity: 2.2 gal. Weight, no fuel: 243 lb.